Source: Thomas Wright, Songs and Carols Now First Printed, From a Manuscript of the Fifteenth Century (London: The Percy Society, 1847), Song #56b, p. 63, printed verbatim from a manuscript probably owned by a professional musician, and apparently written in the latter half of the fifteenth century, circa 1471-1485. For owr blyssyd lady sak, bryng us in good ale. Nor bryng us in no whyt bred, for theriun is no game. And for our der Lady love, brynge us home good ale. In the Harl. MS. it is not accompanied with the music notes, as here; they appeared of sufficient interest to be engraved for the present volume. Also found in Thomas Wright, Ed., Festive Songs Principally of the Sixteenth and Seventeenth Centuries (London: Percy Society, 1848), p. 16, where he notes: "There is also a copy, not so complete, in Harl. MS., 541, and printed in Ritson's Ancient Songs." 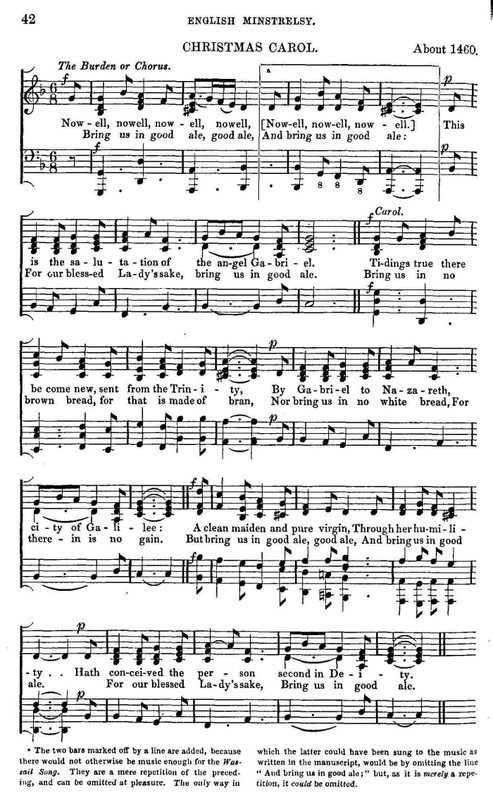 The engraving was not of this song, but of Nowell, Nowell, Nowell (which is the same tune). Chappell then provided the above lyrics. and then noted: "An inferior copy of this song, without music, is in Harl. M.S., No. 541, from which it has been printed in Ritson's Ancient Songs, p. xxxiv. and xxxv." The text Chappell refers to is Bring Us Home Good Ale, Sir (Ritson, Ancient Songs and Ballads, 1790). Ritson notes that "It is of or about the time of Henry VI. and is given from MS. Harl. 541."